Photo posted on Flickr by plusultratech. 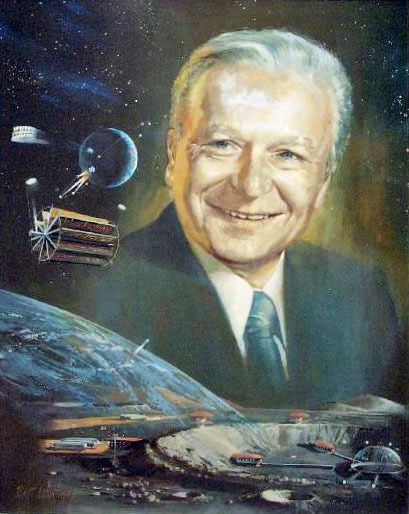 Photo from letsgoseeit.com, from the collection of portraits in The International Aerospace Hall of Fame.
" Man's mind and spirit grow with the space in which they are allowed to operate. " "Man, the cutting edge of terrestrial life, has no rational alternative but to expand the environmental and resource base beyond Earth." "The concept for space travel carries with it enormous impact, because it challenges man on practically all fronts of his physical and spiritual existence. The idea of traveling to other celestial bodies reflects to the highest degree the independence and agility of the human mind. It lends ultimate dignity to man's technical and scientific endeavors. Above all, it touches on the philosophy of his very existence. As a result, the concept of space travel disregards national borders, refuses to recognize differences of historical or ethnological origin, and penetrates the fiber of one sociological or political creed as fast as that of the next." "Man, the cutting edge of terrestrial life, has no rational alternative but to expand the environmental and resource base beyond Earth. Global development, therefore, must be based on an open world concept and include both the development of extraterrestrial resources and the wiser management of our terrestrial resources. This is the extraterrestrial imperative, its central goal is the preservation of the civilization. The 21st century will see the planets drawn together and the complexion of human civilization changed. Space has already demonstrated that a bountiful future is not possible for mankind without it. Herein lies the ultimate greatness of space flight." "While civilization is more than a high material living standard, it is nevertheless based on material abundance. It does not thrive on abject poverty or in an atmosphere of resignation and hopelessness. It needs vigor as well as vision. Therefore the end objectives of solar system exploration are social objectives in the sense that they relate to, or are dictated by, present and future human needs." "American space exploration is informed by ideas about westward expansion and manifest destiny, this sense that Americans are explorers and pioneers." • Benaroya - Lunar Settlements by Haym Benaroya, &2010', p. 703, Tells of his interest in developing space. • Hunley - The Development of Propulsion Technology for U.S. Space-Launch Vehicles, 1926-1991, by J. D. Hunley , © 2007, PP. 175 -88. Background on Ehricke and evolution of the space programs. • Jenkins - To Reach the High Frontier: a History of U.S. Launch Vehicles by Dennis R. Jenkins, © 2002, pp. 334-356. 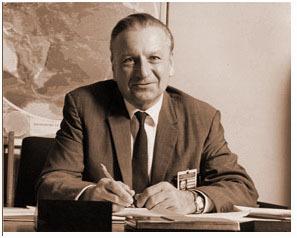 Story of the organizational dynamics among the space pioneers (high drama at certain stages). • NASA - Liquid Hydrogen as Propulsion Fuel, 1945 - 1959 "Early High-Energy Upper States: Origins of Centaur"
• Neufeld - Von Braun: Dreamer of Space, Engineer of War by Michael J. Neufeld, © 2007, page 379+. Tells of the clash of engineering cultures between Huntsville's conservative way of doing things and those of Centaur (where Ehricke worked).